I don’t really follow gold, per se. But, seeing that it made a new high today (1646.80), it seems like a good time to take a look at the technical picture. 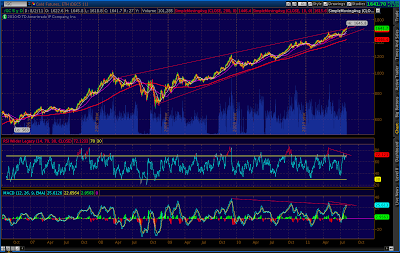 Gold has been in a rising wedge for over three years — a long time, in technical analysis-land. A couple of other things can be seen from this chart. First, there is apparent divergence between price and technical indicators. 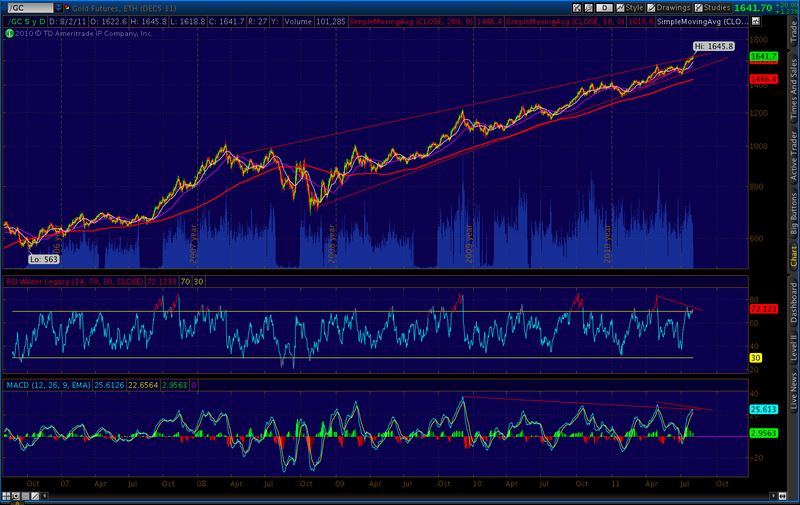 Notice that RSI, MACD and histogram all sloping downward while prices have continued to advance. Also, at today’s high, GC completed a bearish Butterfly Pattern. These sometimes extend beyond the 161% level, but that’s the most common D point target. Also common in Butterflies is a rather strong reversal. The initial target would indicate a drop to the .618 level of 1533. 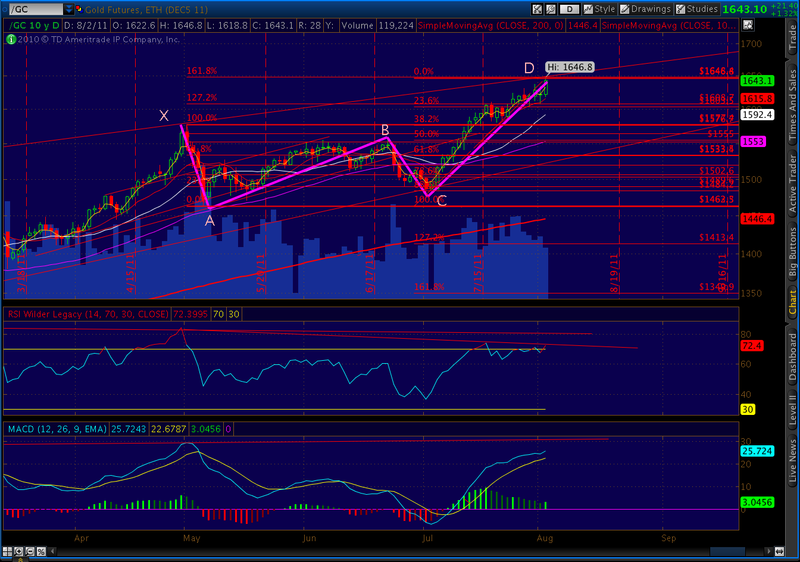 But, Butterfly patterns frequently correct to a 1.618 extension of the XA leg, meaning a downside to 1350. The “middle ground” 127.2 extension target is 1413. Placing a bearish trade in a red hot market takes a lot of nerve — and tight stops. And, gold has acquired an elevated status lately — given the US debt issues. 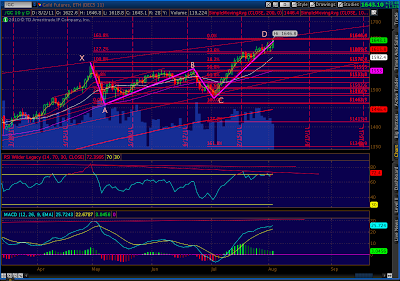 But, the harmonics patterns have been very accurate the past several months across markets. We’ll see how this one plays out. Thanks. Probably stepped in it with this gold forecast, but nothing ventured nothing gained, right? Thanks for your insight, you have been spot on for the last few months! Congrats! I've never been able to put my finger on it. A logical rule of thumb is that it should at least match the speed of the advance — especially against a backdrop of fear>greed. Does the bat pattern speak to the speed of the retrace? Have only been following your blog for about a month now. Great analysis, very much appreciated.